I was able to attend the Wensleydale meeting in Estes Park this year and took along a few of my animals to show. I’m told it was probably the largest show they have had in terms of animals entered. Estes Park was absolutely gorgeous that week and aside from having to retreat from the outside show ring to inside the barn a couple of times due to the threat of lightening, it was a fabulous time. I entered a colored yearling ewe who won Champion Colored Ewe and a white yearling who won Champion White Ewe! After Estes Park Wool Market, I went on to the BSG. At this show, the same colored yearling who won at Estes Park again won Champion Ewe in her class. 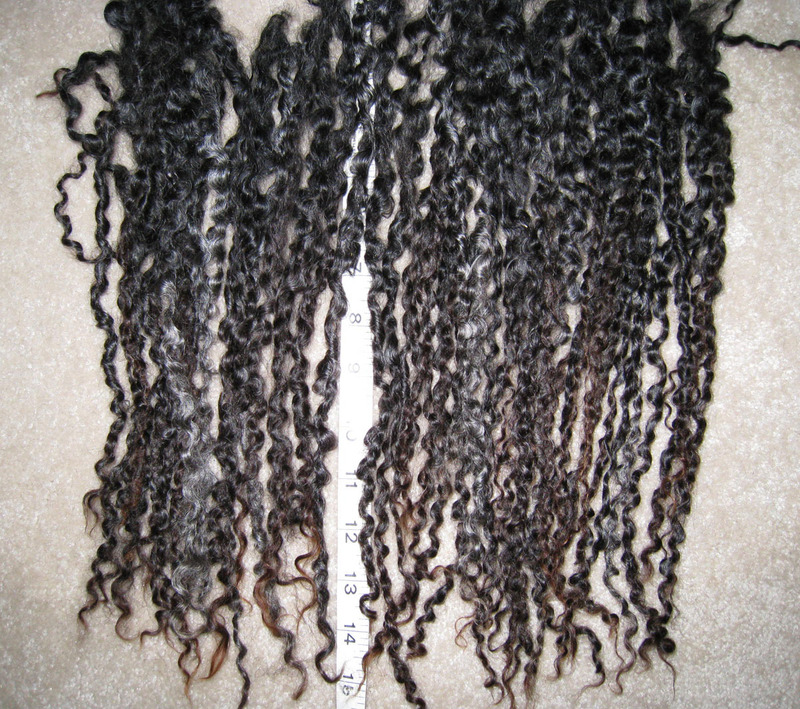 She carried about 7″ of lustrous, tightly curled fleece. My white Wensleydale lambs did exceptionally well at Black Sheep Gathering, winning Champion Ram (with a ram lamb), and Reserve Champion Ewe (with a ewe lamb). For the final placings of Champion and Reserve Champion, lambs compete against adult animals and it takes an outstanding lamb to place above the more mature sheep in the class. One of the final competitions at BSG is that of Young Flock, consisting of one ram lamb and two ewe lambs. 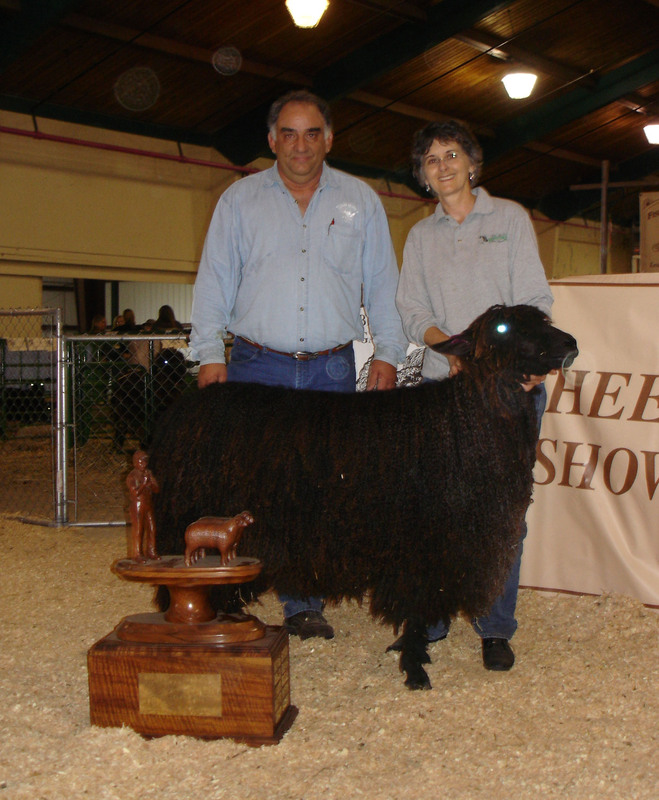 A “best young flock’ is chosen from each class of sheep (different breeds and/or colors) during the two-day event and then the overall best is chosen. My white young flock won! The judge, Dave Cook, explained that they were the most consistent trio of the 15 flocks shown. They all exhibited excellent conformation and consistency of fleece not only on each animal but also as compared to each other. The 2008 show season is behind me and although I wasn’t able to travel to as many fairs as I would have liked this year, the memorable showing was at Black Sheep Gathering in Eugene Oregon in June. This was the first time that the Wensleydale breeders in America have rallied together and had their own class at a major festival in the U.S. There were 7 breeders and 24 sheep shown – although we had to combine the white and colored sheep into the same class, it was a good competition. Mark Eidman was the judge at BSG and in my opinion, is one of the most knowledgeable and objective judges we could have asked for. While a self-professed “fine wool” man, Mark has always had the ability to assess any breed of sheep according to its standards without personal bias. 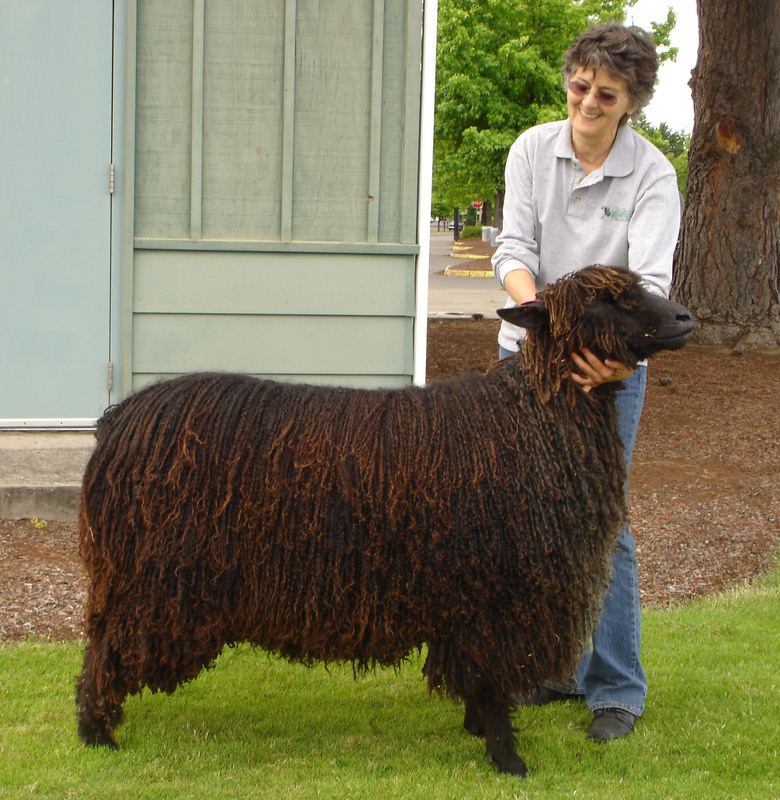 The most exciting part of BSG for me was winning the top award with “Carlson 705”, a colored yearling ewe that won many champion ribbons as a lamb and returned to the Black Sheep Gathering in Eugene OR carrying 15” of gorgeous purled fleece. She first won the Champion Wensleydale Ewe and Best Colored Wensleydale awards, and on the final day of the show, this ewe returned to the ring to compete against the 32 individual class champions of the event and was awarded Supreme Champion Sheep of the show! She certainly attracted attention and lots of photos were taken. Volunteers helped to carefully hand shear the long locks before returning home. This extremely long fleece is selling for $8 per2 oz portion (pictured), making this the most valuable fleece I've ever had at $64/lb. The ewe produced a total of 13 lbs of skirted salable fiber. 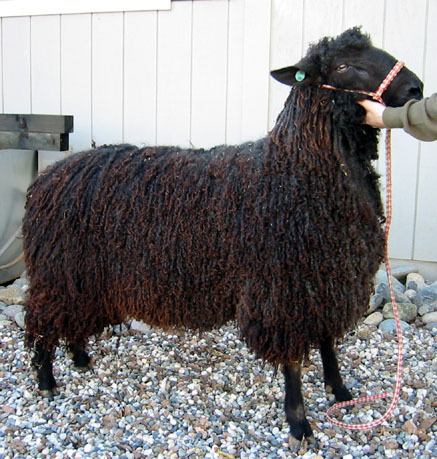 Not every Wensleydale is capable of producing a fleece of this length that remains in an untangled fine lock formation. In England they told me that they carefully select the animals they are going to let ‘grow out’ for the following season’s show classes as some have too much density (and probably other characteristics I have yet to determine). I have to admit that this ewe did receive some special care during the year in order to keep this fleece from matting and felting. After her fleece reached about 8″ in length, I had to remove the cover and put her into a clean grassy field (with one other ewe as company) where she was not subject to being fed hay that would get filtered down into the fleece. Any supplemental feeding was with pelleted alfalfa. Another great Wensleydale shown this year was “Carlson 707”, a really large colored yearling ram who was awarded the title of Champion Wensleydale Ram at BSG 2008. He was second place Colored Wensleydale loosing only to the yearling ewe (above). This is one of the nicest rams that I’ve produced in a long time. He is very large, has great bone, good blocky conformation and a lustrous dark gray fleece. In addition, he has a very nice disposition – which is especially important with a larger ram. 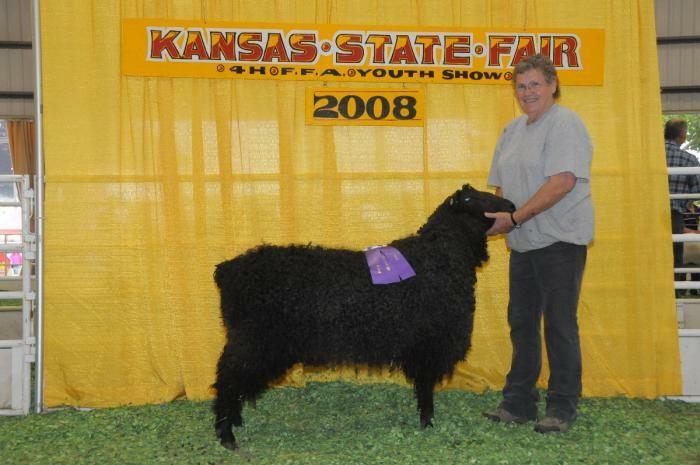 This ram has been sold to a breeder in Canada who arranged for him to be shown at the 2008 Natural Colored Wool Growers National Show at the Kansas State Fair – where he won Champion Longwool Ram! ‘Carlson 707’ will be exported next year and will be the foundation sire for the first Wensleydale flock in Canada.